Just outside of the Delta, the "Alliance" run on a sand-bar and stayed fast until she was "rocked off." The rocking being produced by a large number of men running from one side of the boat to the other. The Alliance arrived at the mouth of the Mississippi River at 11:00 pm, took on a pilot and proceeded to navigate up the river toward New Orleans. Wide view modern day map showing the estimated route and location of the 16th Ohio, on board the steam propeller ships Exact and Alliance, on its voyage from Matagorda Island, Texas, to New Orleans, Louisiana, April 18 through 20, 1864. A - Matagorda Island, Texas, where the 16th Ohio boarded steamships bound for New Orleans on April 18, 1864. B - Estimated location of the steamships carrying the 16th Ohio back to New Orleans on the night of April 18, 1864. 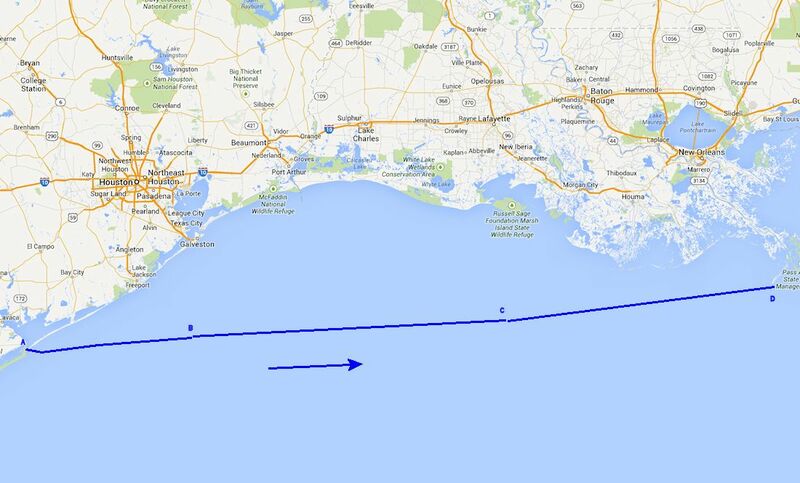 C - Estimated location of the steamships carrying the 16th Ohio back to New Orleans on the night of April 19, 1864. D - Estimated location of the steamships carrying the 16th Ohio back to New Orleans on the night of April 20, 1864, arriving at the mouth of the Mississippi River.